This gallery, which will document the demolition of W & J Riding's old depot at Longridge, is presently under construction! Please come back soon as more details and pictures will be added over the coming weeks as the whole depot is demolished making way for a new housing estate and Aldi supermarket. Inside the 'rip and tip' shed at Riding's old depot showing one of the last Van Benton tankers to be loaded at the soon to be demolished Longridge depot. Pallets were lifted onto the gantry and individual sacks were dropped onto the conveyor belt which were then slit open allowing the powder to fall into the tank below. Riding's started this particular operation back in 1983 at the request of ICI Ltd and it continued until the final day of operations on the 28th October 2017. During that period of 30 years in which time they did five loads a day there was never a single complaint. It was also possible to discharge 1 tonne bags or containers using an auger and the equipment on the left of the picture. The end of 'rip and tip' operations at Longridge as the very last bag of plastic powder is dispensed into the tanker below. ERF EC11 6X2 tractor unit Reg No S153 RNB stands in the deserted yard at Longridge after performing it's last shunting duties and awaits it's fate on the day the depot closed down. It has been saved for preservation details to follow. The 28th of October 2017 and the final tanker load of plastic powder pulls out of the depot at Longridge in a Van Benton tri-axle tanker. Just a few days later demolition of the whole site began. 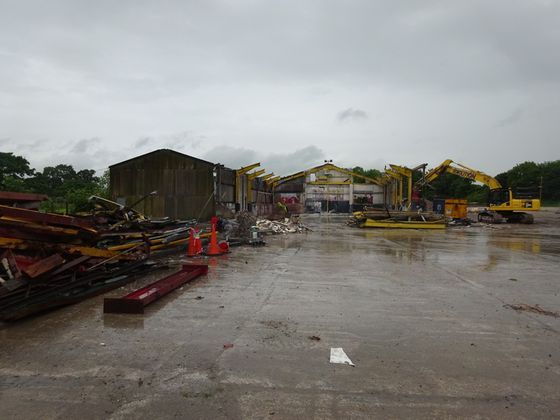 A rather sad looking view of the decommissioned fuel pumps as they await being ripped out of the ground and sent for scrap during the demolition of Longridge depot in 2017. There was also another pump on either side of the entry so it was possible to fill up four vehicles at the same time. If the drivers left the vehicle straight it was also possible to accommodate four more behind the ones fueling up, thus taking eight lorries off the adjacent main road. Originally these pumps were made in house and each one was capable of dispensing 18 gallons per minute. The original Daniel Platt Garage and Riding's offices on Whittingham Road Longridge are seen here shortly before the bulldozers moved in. The old garage and service bays are all but gone in this picture taken in Autumn 2017. Autumn 2017 and the demolition begins of W & J Riding's old depot on Whittingham Road Longridge. With the demolition team moving in it's not long before the old depot buildings are reduced to rubble. As well as the office block and garage being demolished the warehouse and 'rip and tip' shed were also being taken apart at the same time. 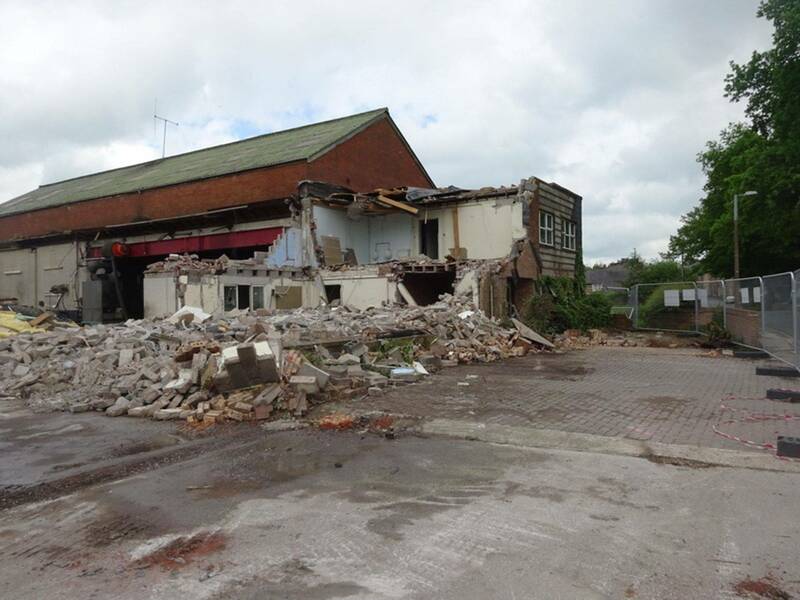 As the demolition continues it is does not take long before the garage and office block are torn down. The final days of the demolition of W & J Riding's old office block continues as the heavy machinery tears the building apart. November 2017 with the offices and garage gone the whole site is now almost leveled in preparation for the new houses and Aldi supermarket. The scene in February 2019 with the depot now long gone the site now contains an Aldi supermarket along with a new housing estate. Walter Carefoots yard still remains and can still be seen just to the right of Aldi. Click on picture for widescreen view..